Moving in the winter can be challenging, but it doesn’t have to be a bad experience. Follow these tips to make your winter move go a little more smoothly. The most time-consuming part of moving should be getting everything you own into boxes. Fortunately, this part of a move is done indoors, giving you a warm and dry place to work through your stuff. Take time to ensure that breakable items are wrapped carefully, even if you’re just moving across town. Items tend to break as boxes are loaded and unloaded. If you’re using Zippy Shell, the risk of items being broken before arriving at your new home is extremely low because you only load and unload once. In the winter, slipping on icy sidewalks and roads is a big concern. Take some time before you start loading your Zippy Shell to make sure that you have a safe pathway to and from your residence. In the winter time, moving into a new apartment or house without any way to heat the place can be dangerous. It’s also a big hassle to try to unpack or set up your computer before you have electricity or an internet connection. Get your utilities turned on before you move in. If you can, leave them on an extra day in the place you’re moving out of as well. That will give you extra time to clean and grab any last minute items. Leaving your items on the sidewalk exposed to the cold can cause a lot of damage. Electronics can break and furniture will contract, causing joints to get out of line. Avoid these problems by moving everything into a shelter as quickly as possible. Instead of laying out items in front of your home, set up an indoor staging area to organize items before packing. 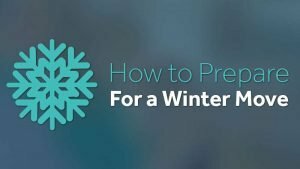 If you plan on leaving boxes outside for a while when you’re packing or unpacking, the items in those boxes will be exposed to the cold and snow. Prevent damage by insulating items such as electronics. Put cords and small items in plastic bags and then wrap those bags in thick blankets. This will help to protect against the cold. 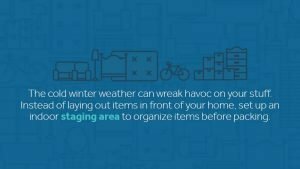 If the forecast calls for a snowstorm, schedule your storage and moving activities for another day. Pick moving services that are flexible about the day and time to avoid moving when conditions are less than optimal. If you’re driving a long distance, make sure you avoid bad weather along your route. If you’re ready to move, Zippy Shell is offering a great deal. For this month only, you’ll get 50 percent off content protection and $40 off storage rental when you reserve a Zippy Shell. Just mention this ad when making your reservation. You can find out more about Zippy Shell and the services we offer by visiting our website.